﻿ H.G. de Wolff - Wie betaalt de staat? E.A. Bakkum is professionally active in the Sociaal Consultatiekantoor, where he holds the position of solicitor. He loves to reflect on the labour movement. 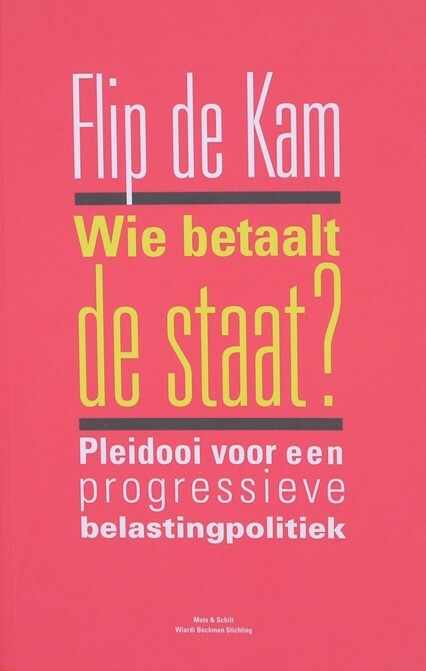 Flip de Kam, the author of Wie betaalt de staat?, belongs to the leading thinkers within the Dutch social-democracy. He was also a member of parliament for the Partij van de Arbeid, for a short time, in 1977-1978, but in the end he preferred a career in science. In the following decade he was a productive publicist, sometimes together with Frank Nypels, mainly of books about the incomes and expenses of the welfare state1. Those books were aiming to reach a broad public, politically coloured, and written in a popular style, with appealing titles like Het gat in de hand van Nederland. After this good decade it became quite, and his texts became more scientific. Wie betaalt de staat? is a co-production with the Wiardi Beckman Stichting, the scientific office of the PvdA. De Kam states even in his foreword, that the manuscript did only reach the printing press thanks to the continuing encouragements of Paul Kalma, at the time the director of the WBS. That is really a strange effusion for a publicist. Apparently he had become in low spirits. De Kam also writes in his foreword, that he wants to stimulate the thinking about the aims and the form of the fiscal system. As appears from the subtitle - pleidooi voor een progressieve belasting-politiek - De Kam argues in favour of a remittance to the state finances according to the ability to bear. De Kam is a bit bitter about the tax reform of 2001, that has been carried through by the Kok-2 administration (better known as Paars 2). He would gladly put back large parts of this reform, including the famous box system. Wie betaalt de staat? is pleasant to read. The many examples are an asset, and enlighten the discussed laws and regulations. But in spite of these attempts to make the contents accessible, it is still a text book with scientific aspirations. The arguments of De Kam are matter-of-fact and scientific. When he writes (p.8): "During the expositions of my ideas the left-wing blood sometimes creeps where it can not go", then this is not an inclination to be dogmatic or demagogic. The book consists of ten chapters, and the first four are introductory. After these general chapters follow thematic chapters, about the flat tax, the reform towards fiscal social insurances, tax on wealth, communal taxes, and the European harmonisation of taxes. These are all topical questions, that are indeed relevant. In the final chapter De Kam returns to his initial thesis: the progression in the tax levy. Incidentally, the repetition characterizes the book, and may reveal pedagogic motives. Your reviewer now summarizes the chapters. Please join in. In the general chapters the fiscal system is explained, of course in its form of 2007. The Dutch tax mix follows approximately the development of the EU-15. It is interesting that De Kam treats the social security and the taxes on an equal footing. For there is no direct relation between the contribution and the service in return. The politics tries to guide the human behaviour by means of the taxes. In case of tax exemptions it is not surprising that the higher educated people benefit the most. The system develops in the direction of a lower income tax (IT) and a higher tax on added value (VAT). The VAT is degressive, that is to say relatively lower for the higher incomes. Also the social contributions undermine the progression. It is alarming that since the introduction of the box system the property is taxed rather modestly. And the property gains are not taxed at all. The rise of environmental taxes is new. De Kam makes the surprising statement, that the present Dutch tax load is actually not well known! Debt financing is nothing but delayed taxes. Conversely, the economic growth increases the income of the state. The taxes on (cheap) labour should be diminished. That has already been realized by means of labour discounts and the work bonus. But these require savings elsewere. De Kam believes that they can be found in the public transport2! In addition he recommends the introduction of a system of individual taxes, and he wants to abolish the so-called dresser exemption. Often there are ways to evade the taxes, at least partly, or to delay the remittance, in eager expectation of better times. If need be people can move over the border3. An intriguing question is whether taxes, for instance on profits, can be evaded by shifting them on to others, in particular on to the consumers4. In the present times it is not surprising that De Kam wants to reform the deduction for mortgage interests. Due to the progression in the IT the higest incomes benefit most! Less well known is that also the exemption of the retirement savings should be reduced. For the higher incomes benefit greatly from this scheme. Social contributions are really a flat tax. Yet most people think that the flat tax is an injustice, and moreover De Kam can not find arguments in its favour. With respect to the social insurance, De Kam prefers to finance them with fiscal means, also in order to stimulate progression. Besides the fiscal payment is needed in order to limit the height of the contributions. And the elderly will have to pay their share, especially with regard to the state pension. The two largest items of property are the owned home and the pension. Since 2001 the Kok-2 administration has abandonned the idea of an equitable burden sharing, when she introduced the uniform levy of 1.2% on property, regardless of the factual income. In 2007 the administration Balkenende-4 introduced grand arrangements for foreign firms, and she thus stimulated the fiscal competition. Meanwhile in trade and industry the Netherlands is known as a fiscal paradise. And the state is left with a paradise suit. De Kam states that the communities should get additional possibilities to levy their own taxes. This would give them more policy freedom. But in 2006 the administration reduced the taxes on real estate, so that the communities lost an important source of income. According to De Kam this is a deterioration. And the change contradicts the policy in neighbouring states. In many cases, like the corporate tax, the European harmonisation is perforce. Profit is a highly mobile basis for taxation. The information exchange of data on savings is a positive development within Europe. But it is absent in the case of investments. It is remarkable that De Kam sums up only in the concluding chapter the demands, that must be satisfied by the tax system. He mentions six demands: clear rules, data with regard to the yield, low administrative costs for households, compatible with economic growth, equal rights for all households, and progression. This chapter has the merit that it compares the fiscal paragraph in all left-wing election programmes (PvdA, Groen Links, and the Socialistische Partij) from the start of the 21th century. These reflect evidently the spirit of the age, but the comparison does illustrate the way to tackle this task. Simply spell out in a systematic manner. Stop at the thought. Apparently it is not a salvation to participate in government. The PvdA, being the only in the left-wing trio that governed during this decade, did not succeed in realizing her plans for redistribution. Even in 2002 the PvdA leadership rejected an initiative by the members to reform the deduction for mortgage interests5. Finally in 2006 the party made a volte face. No left-wing party advocates the Tobin tax, and also De Kam condemns it! It is not feasible in practice. Unfortunately he can not perceive a clear and general policy of the left-wing parties, so that as a consequence their position in the political debate is weak. It is just for this shortcoming, that De Kam has written the book. Probably this review makes clear that Wie betaalt de staat? is not a truly stirring book. The subject does not naturally lend itself to agitation. But your reviewer thinks that also the tone is a bit resigned, more than is necessary. Nevertheless it is a book filled with interesting information, insights and views. It definitely deserves a recommendation.